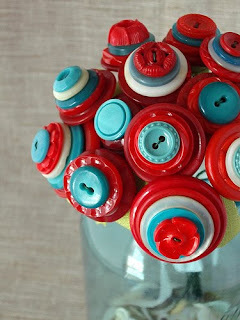 Don't you just love the color combination of red and aqua on these buttons? Me too. When my friends saw the color combination I was working with, a lot of them said, "Hmmmm, I would never have thought of putting those two colors together." And I might not have either. But to me it says "Hey, we're both retro and modern. And we definitely belong together." If I would have written this earlier, I would have called it "What was I thinking??" or "Someone please stop me." Why? Because I have so many "NEED to be done" things on my quilting list. Instead, I signed up for an on-line red and aqua block exchange. Just because I wanted to. I didn't really have the time. Definitely not a must-do. Nope. Just for fun. No, I'm sure I will get 100 in the mail. And when I do, I think I might put them back together like this. And look at the socks I wore the day I sewed these blocks, and didn't even realize until I was photographing them. To quote my friend, Tanya, "What, doesn't everyone unknowingly match their socks to their quilt project of the day??" The sock/block combo is the bestest! Very fanciful, can't help feeling happy looking at those colors! It's like picking cherries on a sunny blue sky day! Looking forward to getting your block! Too funny about the socks. I didn't blog my blocks - sorry! I LOVE swirly dot fabric and the cherries on blue background fabric. They would make a white kitchen so happy. I love that colour combo. And your socks are pretty snazzy too. One more thing- I just was one "oh-fransson! "blogsite and there's a cute little red and aqua quilt. Red and aqua are the best color combo there is! Love the blocks, and I'm sure the quilt will be just as great. So fun!